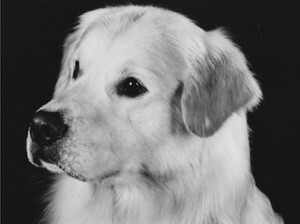 We are discussing one of the most popular breeds of dogs today, the Golden Retriever (GR). 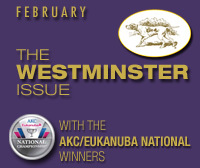 An enjoyable breed ranking third in 2012 registration stats, whose popularity has exploded over the past 40 years. Interestingly, during the early to late 1960s, the social phenomena had not yet hit the breed as it ranked about 30th in registrations stats. 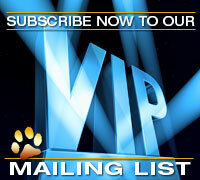 That it soared to meteoric stardom is due in large part to it being the ideal family dog. 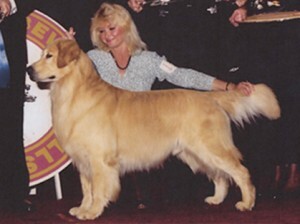 Mrs. Bernadette Cox of Kazak Golden Retrievers, established in California during 1964, discusses the breed. Bernadette’s limited breeding program over the many years produced eight consecutive generations of linebred, owner-handled champions that included GRCA Outstanding Sires, Show Dog Hall of Fame members, working gun dogs and movie actors. However, Cox’s most meaningful contributions were guide dogs. Her earliest litters supplied prospective puppies to the Guide Dogs for the Blind organization in California. She was approached by the philanthropic organization and after having her dog’s dispositions and mentality evaluated; she donated five Kazak puppies from her early litters, which eventually contributed to the organization’s foundation breeding program. A laudable and proud donation indeed as the merits of the dogs selected for inclusion in this organization were exceptionally high. Guide Dogs for the Blind were seeking dogs that not only had excellent health, intelligence and temperament, but also exhibited a willingness to work and thrive on praise with an easy care, double-coat. A breed whose size and weight was compatible for working alongside people. These GR’s were trainable and tractable, rising to the occasion, or would lay quietly, reserved. As Bernadette explains, the GR of yesteryear were quite different from today’s peculiar temperament, even different in appearance as we learn further on. The earliest GR’s attitude was tolerant, trustworthy, laid back companions, contrasting to many today who are animated, some wired, hyperactive; constantly seeking attention or play, who are quite flashy and robotic in the show ring. Our discussion begins with both of us, side by side in the breed ring, observing a lineup of GR’s. Bernadette’s first words of advice are easily remembered. It is best to imagine the dogs behind a sheet with a light shining on it so that only the silhouettes appear. As with many breeds, the silhouette dictates the breed. What immediately stands out to Bernadette in the silhouette is the moderately long neck, with a prominent nape, which is needed to accommodate strong muscling for carrying ducks, pheasants and other fowl through upland brush, swamp and other bodies of water. She requires the neck to blend smoothly into very well-laid back shoulders and she looks for a prosternum. The forequarters are of great concern to her as an experienced AKC Sporting Group and Best in Show judge, as well as a veteran retriever breeder. The well laid back shoulder and elbows set well under the scapula blades have become scarce in many breeds. Even the topline of today differs in shape than when Bernadette began in the breed. The topline of yesteryear was more natural, not straight or sloping and it did not finish with a high tail set similar to a flag. The desirable topline should be a slight arch over the loin, which is composed of muscling that develops the rise as opposed to a flat, level back. Bernadette counsels that faulty fronts with short upper arms, lack of forechest, and short legs are an affront to this working retriever. Yet another area of concern she stresses are feet, reminding us that the breed standard calls for a round, medium-sized foot. In spite of this, today’s trend are small, cat paws with very short, stubby toes. Fanciers may not realize that a true, round, compact foot is to have two center toes slightly longer than the outside or inside toes. A compact, round foot is not to have all toe lengths the same, which hinders field work. In Bernadette’s opinion, the oval or spoon shaped foot, similar in all respects to the round foot, except the two center toes are slightly longer, is also functional for the GR. Unlike hare feet, this slight elongation allows for practical length of center toes that provide stability and improved overall balance. This is realistic because when the dog scrambles out of the water, his longer center toes aid the claws to grab, hold, climb and provide traction on slippery rocks and muddy, steep inclines. The absence of toe length is not cosmetic but dysfunctional. A correct foot must be accompanied by a slightly sloping pastern, in contrast to frequently seen, bolt straight pasterns with the dog nearly knuckling over. Today, many GR’s appear to waddle and pound in gait. Bernadette feels this is most likely due to short, stubby toes on cat paws accompanying an upright pastern. Often enough, straight pasterns are coupled with upright shoulder blades. Consequently, there is a diminished momentum of arc of the front leg swinging from an open angled shoulder, and strides fall short. Since upright pasterns lack shock absorption, the dog pounds when the foot hits the ground in the front. This constant striking reverberates up through the leg and is easily recognized by a seasoned observer. While on this topic, Mrs. Cox discusses the proper gait of a good specimen. First, she instructs that too many are shown strung up. Any retriever breed naturally lowers their head while gaiting as these breeds are considered the heavy-duty, pickup crew. They are unlike pointers and setters who are running out, visually stimulated, sighting and scenting to flush birds into flight. A correctly gaiting GR is to single track. It is common today to observe double tracking — waddling likened to a Charlie Chaplin gait — in place of smooth, low, gliding reach and drive. One of the most easily observed faults on the GR are short legs. Bernadette seeks a proportion as close to 50-50 without losing symmetry, that is the length of leg from ground to point of elbow is equal to the distance from the top of the withers to the point of elbow. The easiest explanation for why faulty, short legs are an offense to the working retriever is to visualize riding a bike with small, undersized wheels. You will have to pedal a great deal more to cover as much ground as a bike with large wheels. Typically, these small wheels also break down faster if they are carrying heavy mass. Bernadette looks for a trunk in a ratio of 12:11, as called for in the standard. This slightly longer than tall ratio is what is required for performance. Even though some are groomed and manicured to appear longer, sadly many specimens are square, which is easily identified by their gait. A square GR will crab when gaiting. A correctly proportioned dog is to be well-ribbed back with a moderate length of loin facilitating ease in his movement with no leg interference. As a reminder, length of sternum and ribbing allows for cargo room holding strong lungs, heart and muscling. Yet, we do see specimens that are too long in trunk. These are typically too long in loin and this span between thoracic and pelvic girdles is just a weak suspension bridge. A GR is to have a moderate bend of stifle. Some modern versions are overangulated in the rear, which extend the rear feet well behind the pelvic girdle seat bones. Balance and moderation is what one should seek. The coat today is very different from what they were in the 1960s. Nowadays, many resemble Bearded Collies instead of having a correct double coat with a short, wraparound jacket on the back, ribcage, neck, withers and loin areas. This wraparound jacket originally had limited feathering off the brisket, front legs and tail, modest pants and a mantle. In contrast to today, we see profuse coats, with some having long hair starting off the back enveloping the dogs underline. Moreover, the texture of the popular coat is incorrect. Dry, brittle, straight, no sheen, profuse, fluffy and or cottony coats require high maintenance. Such textures on companion dogs catch burrs, sticks and mat very quickly, which is one reason why we so frequently see pet owners shaving their GR in the warmer months. Color is yet another preoccupation that concerns Cox. The breed standard states that the darkest and the lightest shades of gold are to be penalized, nevertheless she stresses that structure always is favored over shades of coat. Looking at the dog, one feature that stands out is a correct head. Sadly, over these many years of popularity, the size of the dog and its heads have become smaller, even an occasional snipy muzzle. The eyes have suffered the same fate. Small eyes appear squinty or mean and are very undesirable as it ruins an otherwise intelligent, confident, kind expression. A faultless head of the 1960s was proportionately larger: a flatter and broader skull with moderately large, almond shaped eyes. A smaller ear is much preferred and is rather short and fairly high set. This is very dissimilar to the peculiar ear trend seen now. Some have thick leather, are pendulously long reaching past the jaw line, and are set low on the skull. The differences between the correct and the popular are elementary. A swimming retriever carries fowl or game in his mouth with the head tipped back slightly to allow for the weight and size of the package. An incorrect, low-set, heavy, long ear fills with water as the head tips back, never mind the increased risk for ear infection as well as the dog cannot hear his Master’s commands. Mrs. Cox leaves us with meaningful closure. It is true that today, few breeds perform their function and despite our breed standards, breeds’ designs are being tweaked — for the most part in the wrong direction. Innumerable number of breeders are breeding for show ring competition and not according to breed blueprints. But one area that should be of the utmost concern to breeders is disposition. Acknowledging that many breeds now are primarily companions, emphasis must be placed on character, temperament and trainability. Dog breeds that are high maintenance and or difficult to train will become disfavored. This includes unsuitable, profuse ‘cottony’ coats that mat; excessive barking; high-strung, overactive dispositions; or lack of tractability, just to name a few undesirables. All of these unwanted traits are a turnoff to companion owners and the golden retriever as a breed is not exempt from this rule. Posted by admin on Sep 9 2013. Filed under Current Articles, Featured. You can follow any responses to this entry through the RSS 2.0. Both comments and pings are currently closed.